Did you know that Port Canaveral is the second-busiest cruise port in the world? Sailing just past the famous nook of Cape Canaveral National Seashore, home of rockets, legends, and shuttles, you’ll find there is much to see and do here. Florida’s Space Coast is home to some of the world’s most beautiful beaches, and Port Canaveral is a proud entryway to every single one. Walk south from Jetty Park, along the wide white sand of Cocoa Beach, and watch the sun rise. If a day at the beach seems a bit tame for your port vacation extravaganza, tip-toe into the wilderness of the classic Jungle Village for some thrills in the arcade, or play a nice relaxing round of mini-golf. And don’t mind the giant pink elephant with the sunglasses; he’s friendly, we promise. Port Canaveral opened in 1953, and the history that has grown alongside its deep blue water is woven profoundly into the fabric of America. 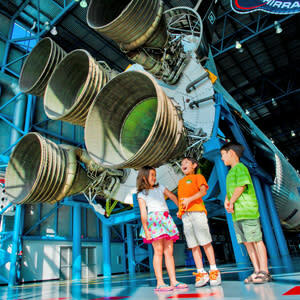 Day trips to the Kennedy Space Center are an absolute must: see the actual spacesuits, gaze at the technical wonder that is Space Shuttle Atlantis as it sits forever on display, and if you happen to time it just right, you may see the next generation of interstellar rockets launch above you. Perhaps the most amazing thing about Florida’s Space Coast is how close to the technological cutting edge you can find yourself while being steps away from pristine swaths of a natural environment standing proud from the ancient past. And in that spirit, a visit to the Merritt Island National Wildlife Refuge is as sublime a form of ecological recreation as one is ever apt to come across. Dolphins, manatees, gopher tortoises, scrub jays, and schools of native fish await. And all of these are just a simple port-based shuttle ride away (Note: it’s a bus, not a space shuttle, but that’s what imagination is for!). Ron Jon’s Surf Shop is iconic in Florida and is the largest surf shop in the world. 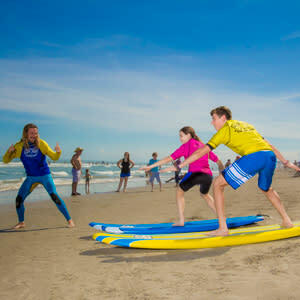 For those wanting to learn the fine art of surfing, they offer surf lessons. For those wanting to try something a little different, Ron Jon’s also offers kiteboarding lessons. Well, that was quite a workout for your day onshore in delightful Port Canaveral. This seems like an awfully good time for a drink and a bite to eat, and fortunately, you couldn’t be in a better place for either. To start, try a tour at the Florida Beer Company, and sample some of Florida’s finest brews. The tasting room is newly designed and state-of-the-art, featuring a dizzying (ahem) array of paintings and art showcasing native wildlife. Taste the Swamp Ape IPA, a local staple and a mysterious creature, at the same time. And after a few pints, or if suds just aren’t on your menu for this trip, head over to Rusty’s Seafood and Oyster Bar, right on the gleaming water of Port Canaveral. The fish always come fresh off the boat from the local waters of Florida’s Space Coast, and the service and pride in preparing them has been in place at Rusty’s for decades. Fishlips Waterfront Bar & Grill is another great option along the same strip of waterfront real estate. So after all that, as you cast off back into the Atlantic aboard those giant cruise ships, the adventure of Port Canaveral will recede from view, but not from the heart.